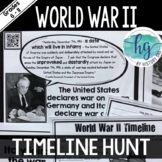 Students have to put 10 major events from World War II in the correct chronological order. Students can also illustrate the timeline and there are 4 items to answer after the timeline is complete. 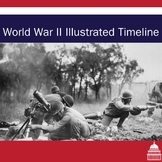 This is a World War II timeline with 13 events. 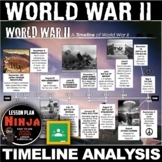 The student are able to cut out and paste the events on to the timeline in the correct order. Completed timeline is included. 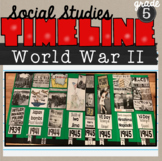 After this timeline I had the students each pick one or two events from the timeline to illustrate. 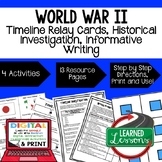 This timeline is short form and goes through the entire course of WWII (as covered in the 5th grade standards). This is great to give students at the beginning of the unit and refer to it after each lesson. AWESOME doc for them to have for a study guide! Teacher Key included. 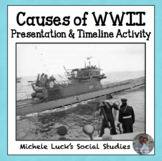 Here is a great way for students to take part in the learning process when teaching the causes of WWII. 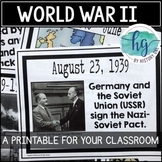 I assign my students an event that assisted with the outbreak of war in years prior to 1939. Students will research these events and them create a 5x7 index card highlighting the specific event. 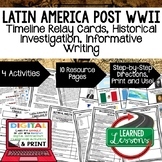 This document includes 4 copies/slips of dates to be included in a WWII timeline. 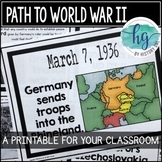 Print and cut the document and have the students locate the dates, then create a timeline of events. Students use timeline data to answer multiple choice questions and locate the main ideas and people. 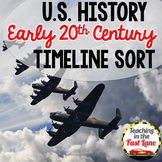 Great for practicing basic timeline skills. Editable.